German schoolgirl Annika Irmler has licked her way into the Guinness Book of Records with her whopping seven centimetre tongue. The twelve-year-old from Tangstedt, near Hamburg, can lick the ice cream from the bottom of a cornet - while her friends have to use their fingers. 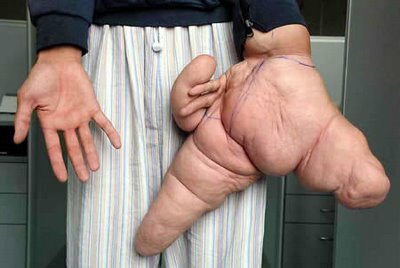 Chinese man Lui Hua suffers from a rare condition known as macrodactyly. When he was hospitalized in Shanghai on July 2007, his left thumb measured 10.2 inches and his index finger measured close to 12. On July 20 surgeons undertook a seven-hour operation to reduce the size of Liu's fingers and thumb. Doctors removed 11 pounds of flesh and bone in the procedure. A second surgery is scheduled to take place. 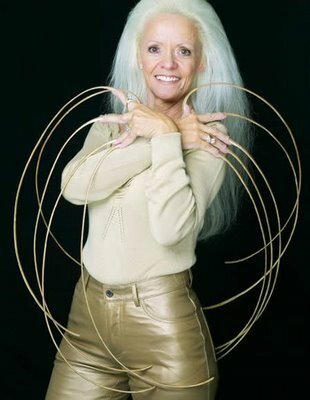 Lee Redmond, a woman from Utah who has not cut her nails since 1979, had grown and carefully manicured them to reach a total length of 8.65 m (28 ft 4.5 in), and was listed in the Guinness Book of World Records as the world's longest fingernails. Sadly, on February, 2009, she lost them in a car crash. 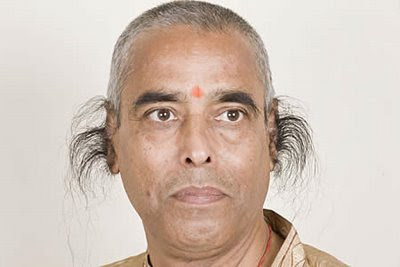 Indian grocer Radhakant Baijpai certainly has a goal in life: make sure that he has the longest ear hair in the world. Radhakant was crowned the official Guinness world record holder for the longest ear hair back in 2003, when his aural fronds were an already-impressive 13.2cm long. But that didn't stop him pursuing his goal of ever-longer hair on his ears. After several more years of carefully cultivating and caring for the ear-hair, Radhakant's tufts now stretch an astonishing 25cm. He is now waiting for Guinness adjudicators to confirm that he has set a new high, hairy bar for his chosen field. 0 Respones to "4 Most Weird Body Parts"